The price for this miracle? Only $850. Are you laughing yet? Neither were dozens of ORNL employees, who complained that the notion that a Southern accent needed fixing was offensive, particularly given that the facility where they worked was located in Tennessee. 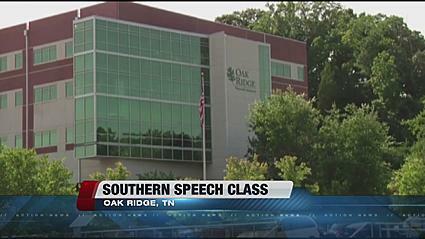 Management pointed out that accent reduction classes for employees hired from foreign countries had been offered for years at ORNL without controversy. They were offering the same service to native-born workers because one such employee had requested it. After a great deal of backpedaling, an ORNL spokesperson announced that the class had been cancelled. I have a problem with this story on many levels, the first being the notion that poor grammar and a Southern accent automatically go together. They don’t. From Baltimore to Boise to Baton Rouge, some folks butcher the English language. And from Akron to Atlanta to Albuquerque, some speak it flawlessly. And let’s not equate regional colloquialisms with ignorance or suggest they need to be eliminated. Where I come from, people with multiple diplomas hanging on the wall say “y’all” and “fixin’ to” and “we might could do that” without apology. Colloquialisms vary widely from region to region in this big country of ours. All of them can be spoken with any accent. Not always convincingly, of course. There’s nothing more grating to real Southerners than a fake southern accent. I suspect that people from Boston or the Bronx feel exactly the same way when they’re poorly imitated. I lived in New Jersey for a mercifully short time when I was eight years old. If I’d had the ability to lose my Arkansas accent, I would have, because my classmates made relentless fun of it. I haven’t lived up north since 1963. But I’m certain that if the fates sent me there now, I wouldn’t change a thing about the way I talk. Chances are I’d play it up, just like my daddy—one of the smartest people I’ve ever known—did for the entire time he worked in New York City. He ordered turnip greens every time he ate out, even at McDonald’s. (He never got them.) He said, “Put that in a poke for me, would you?” when he wanted something sacked up. And he never failed to say “Hi-dee, ma’am” or “Hi-dee, sir” when he met someone. I was mortified back then, but now I get it. Learn to talk like the man on the six o’clock news? Why…bust my buttons. I’d just as soon pay $850 to unlearn something like that.